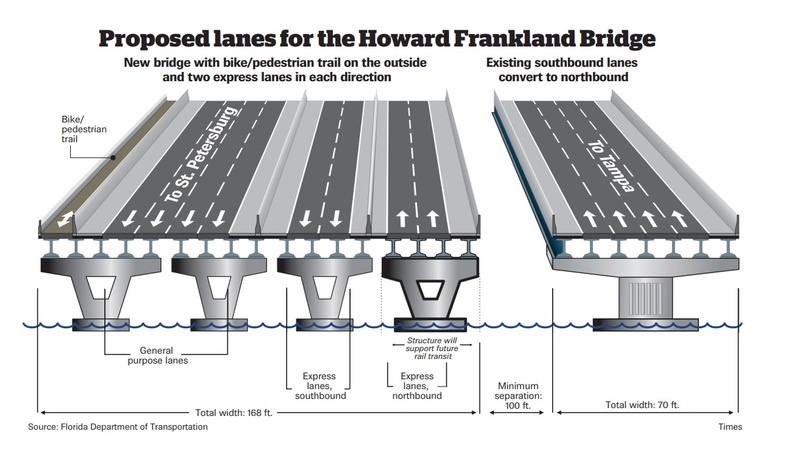 ST. PETERSBURG — The Florida Department of Transportation is prepared to pay a contractor $814 million to design and build a new, 8-lane Howard Frankland Bridge linking Hillsborough and Pinellas counties. A draft request for proposals outlined the project, which would involve eight lanes of traffic and a bike and pedestrian trail. The final version of the RFP will be advertised on Dec. 10. The new bridge will be the largest contract in the history of DOT's local Tampa Bay office, said spokeswoman Kris Carson. The $814 million limit is an increase to the 2017 estimate of $750 million to build the 8-lane bridge. This massive structure will have four lanes of traffic going south, to St. Petersburg. It will also have four express toll lanes: two lanes traveling in each direction. Only drivers who pay a toll, which will fluctuate based on demand, can use those express lanes. The state expects to award the bid in 2019. Construction is slated to start in 2020, with the bridge opening to traffic in 2024. Officials believe the project will have a minimal impact on traffic, as both spans will remain open while the new segment is built. Once the new bridge is constructed, traffic patterns will flip. The current southbound span, built in 1990, will become the new northbound span, carrying traffic to Tampa. The brand new bridge will move traffic southbound into St. Petersburg. DOT will then tear down the existing northbound span, which was built in 1960 and is reaching the end of its lifespan. While DOT knew a new bridge would have to be built, the question of what it would look like was a multi-year saga that involved the department switching plans in reaction to public outcry. In 2016, the state's plan was to put a toll on an existing lane, leaving those unwilling to pay with only three lanes of traffic on the often-congested bridge. The state scrapped that idea after facing intense backlash from community members and elected officials for taking away a free lane. In early 2017, officials came back with a different option: build a six-lane bridge, with one toll lane in each direction, costing an estimated $630 million. But people had concerns with that, too: what happens if there's a crash in the toll lane and emergency vehicles can't get through? Where would any future light rail tracks go? Would buses in the single toll lane slow down traffic? So in fall 2017, officials came back with the latest vision for the bridge: four southbound lanes, two toll lanes in each direction and a bike and pedestrian path.